The new vCenter Server Appliance (VCSA) 6.5 has a backup feature. 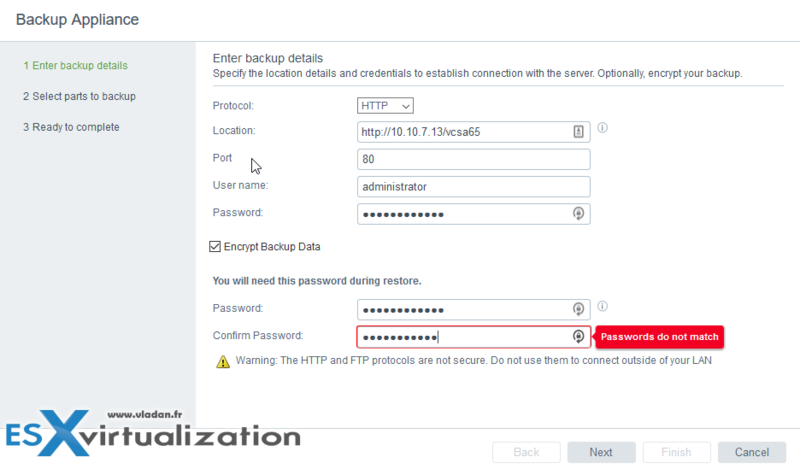 Today’s post is about VMware VCSA 6.5 Backup and Restore How-to. Note that it is an “out-of-the-box” feature which does a file level backup. It’s “built-in” within the appliance itself, and it allows users to backup not only the vCenter Server but also Platform Services Controller (PSC) appliances directly. 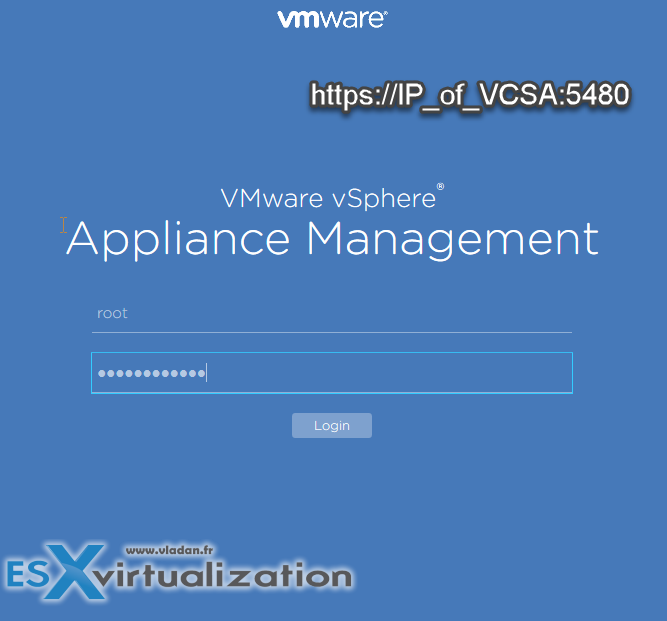 VCSA with embedded or external Platform Services Controller (PSC) is supported. Browse to https://VCSA:5480 > Log in with the password you entered when you have deployed the solution. You’ll see this nice new UI…. Note, that If you use HTTP or HTTPS, you must enable WebDAV on the backup Web server. And then I entered the backup setting, such as protocol, login/password combination (make sure to give read/write rights on the folder where you’re backing up) > and finished the wizard. I had a problem during my test, as one of my VCSA 6.5 services wasn’t running so the wizard was throwing an error. which gives you services which run on one line, and also services which are not running. The “vmware-stsd” service should be normally running (confirmed by @emad_younis). In the real world restore process will look not so easy and funny as on the paper. If VC is down, there’s no possibility to use dvSwitch to assign proper network during restore procedure. So, in case of two pNICs per host it will be OPOF during temporary relocating pNIC to Standard Switch to have appliance restored correctly. Oh yeah, I know. Real world is much more “cruel”… That’s (IT) life… Thanks for sharing. What do you mean by “dynamic” disk? Are you meaning Thin provissioned disks of the VCSA? So how is the state of the distributed switch configuration after a restore? I would setup a test environment first. Then I would do a separate backup of my distributed virtual switch. Remember, nothing beats granular backup option…. So having an additional backup of my distributed switch (even if it is not necessary – I don’t know) it is certainly a good DR plan. 1) No scheduling option – this is .005% of a backup solution. You cannot expect an enterprise to rely upon the vAdmin to remember to log in to every vCenter and manually execute a backup. 2) Restore process – entirely non-intuitive. In most cases, the original vCenter appliance will still be online, but will not be functional. There should be an option to restore to that machine, versus deploying an entirely new machine (which the instructions do not in any way explicitly call out should have the same name and IP addressing as the original, which thereby dictates that the original VCSA be turned off, and possibly renamed) and the attempting a restore. VMware needs to learn how to do data protection and stop providing half-assed solutions that require customers to go poke around creating cron jobs and shell scripts. vCenter is the pivotal component of a vSphere deployment and should be treated as something other than a third-class citizen. I agree… I loved 5.5 and am regretting the migration 6.5. There’s been nothing but pain – from the hated web interface to this ridiculous backup. This “upgrade” has been such a step backwards in so many ways! Good grief! Totally agreed. So far I have seen a lot of problems. I am wondering how product development from VMware could allow this to go live. 6.5 in general has plenty of issues and I could notice how longer it takes to get a good answer when you open a case with tech support. Can this be used to deploy a new VCSA with a different name? Using the same IP isn’t an issue, and the ESXi hosts already refer to the VCSA via the shorter FQDN. I upgraded from Vsphere 6.0 u3 to 6.5 u1 today, but still find issues where SSO and other pieces are referencing the longer FQDN which is causing some issues. Hallo. Has there been any conclusion on what the VDS looks like post a restore? Has anyone tested this? Going from 6.0 to 6.5 Appliance – doesn’t seem to be a restore. 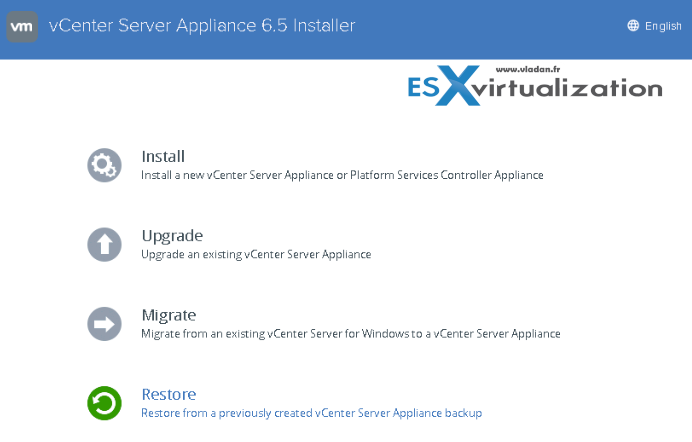 There was a backup in 6.0 – BUT where is the restore in 6.5 Appliance!! !